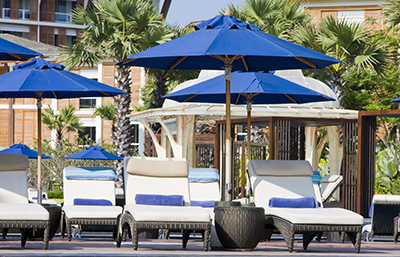 Keep your outdoor living spaces cool and shaded with color coordinated patio umbrellas for your outdoor furniture collection. Cushion.com offers octagonal market style umbrellas as well as traditional dome style garden umbrellas with the fabric cover color and pattern of your choice. Our wood market umbrellas, aluminum market umbrellas and traditional garden umbrellas can be customized with a cover made in the fabric of your choice.